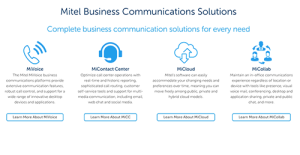 MiContact Center is a package of cloud contact center tools with various degrees of functionality and complexity for businesses of all sizes. The solutions cover Microsoft Lync-based contact centers including outbound, large scale, small team, and informal contact centers. There is also a Center Live package that is offered for those looking for a complete cloud-based solution. MiContact Center comes with an interface that allows agents to handle interactions from various channels and contact points like social media, email, voice, web, chat, and SMS. It connects with Salesforce so you can access your CRM data, and offers integration with external apps through its API. MiContact Center Live lets you do outbound calls with multiple functionalities and modes while giving you reporting, call logs, and live mode dashboards. It also offers tools for supervisors to better manage call center operations and assist agents when the situation calls for it. You get the full spectrum of contact centre features such as computer telephony integration, ACD, IVR, and outbound/inbound dialing with preview, progressive, and predictive modes. You’ll be able to route calls to the right agents based on factors you set like previous interactions, priority, and skills. The platform likewise provides IVR self-service as well as waiting time/queue position notices to queued callers. MiContact Center lets you manage all remote and in-house agents with silent monitoring, and call and screen recording. It also offers a visual, drag-and-drop tool that allows ACD to work with several point of contact like email, chat, and social media. Its robust reporting gives you the means to keep tab of business and operational performance with historical reporting, call accounting, workforce management, real-time statuses, and more. Every enterprise is different, and can call for a special Call Center Software solution that will be designed for their business size, type of clients and employees and even specific niche they deal with. We advise you don't count on getting an ideal services that will be suitable for every business no matter what their history is. It may be a good idea to read a few MiContact Center reviews first and even then you should pay attention to what the solution is intended to do for your business and your staff. Do you need an easy and straightforward solution with just basic functions? Will you actually make use of the advanced functionalities required by experts and large enterprises? Are there any specific features that are especially practical for the industry you operate in? If you ask yourself these questions it will be much easier to find a reliable solution that will match your budget. How Much Does MiContact Center Cost? We realize that when you make a decision to buy Customer Support Software it’s important not only to see how experts evaluate it in their reviews, but also to find out if the real people and companies that buy it are actually satisfied with the product. That’s why we’ve created our behavior-based Customer Satisfaction Algorithm™ that gathers customer reviews, comments and MiContact Center reviews across a wide range of social media sites. The data is then presented in an easy to digest form showing how many people had positive and negative experience with MiContact Center. With that information at hand you should be equipped to make an informed buying decision that you won’t regret. What are MiContact Center pricing details? What integrations are available for MiContact Center? If you need more information about MiContact Center or you simply have a question let us know what you need and we’ll forward your request directly to the vendor.